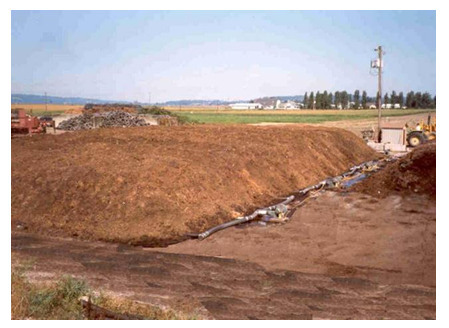 Hello, and welcome to Part 2 of our webinar series on aerated static pile composting. My name is Peter Moon and I am the President and Principal Engineer with O2Compost. 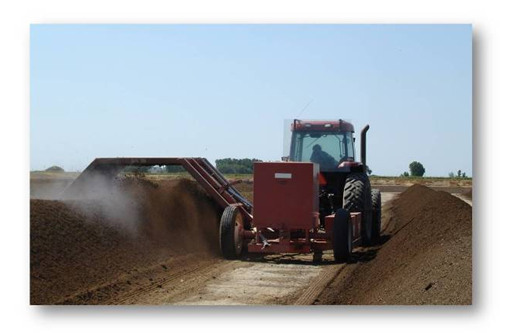 There are three primary benefits associated with aerated static pile composting when comparing this approach to turned windrow composting. The first benefit is the topic of this webinar: Increasing Site Capacity by Reducing the Operating Footprint. The second benefit with ASP composting is that it helps to resolve odor impacts and neighbor complaints. The third benefit, which is of keen interest to most facility operators, is the reduction of cost during the active phase of composting. Active composting is generally considered to be the first 30 days of composting. 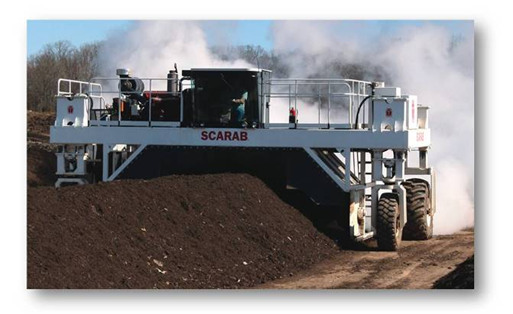 Looking at a variety of windrow turners, this is an example of a Scarab Straddle Type Windrow Turner. These are self-propelled. They tend to run between $600,000 and $1 Million as an initial capital investment. There are many manufacturers: Backhus, Frontier, Komptech, Scarab, Vermeer, Wildcat and many others. In the picture shown here, it is self-propelled and produces a pile about 16 feet wide and a starting height of about 7 feet. The windrow length can range upward of 200, 300, 400 feet depending on the site geometry. Another type of windrow turner is considerably less expensive and readily available by many different types of manufacturers. This is a tow-behind windrow turner. It’s PTO-driven (power take-off driven) from behind a farm tractor. Pile sizes typically range 10 feet wide by 5 feet high to as high as 16 feet wide and 7 feet high. As you can see in picture, there is a considerable amount of space required for the tractor and the windrow turner to drive between respective windrows. 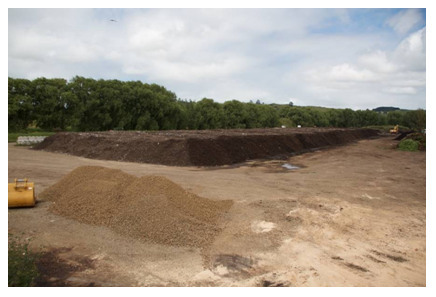 Looking at a few examples of turned windrow compost facilities, the photo on the left is one of our clients in New York State. This is a yard waste and leaf compost facility. 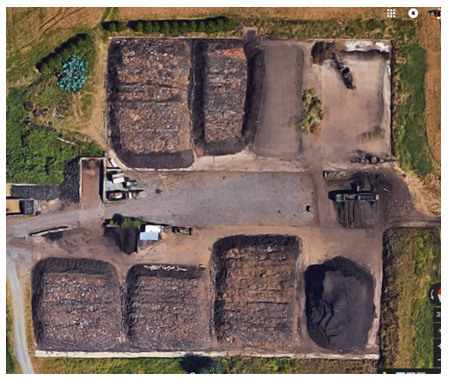 The facility on the right is located in California and is processing yard waste and food waste. 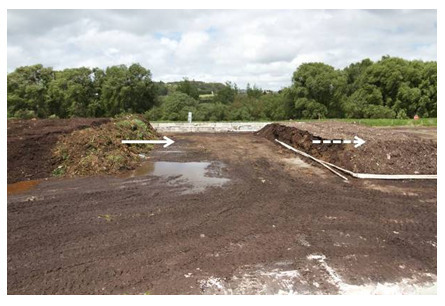 Both of these pictures I have superimposed a rectangle with white-dashed lines that represents the approximate area that we can consolidate all of that turned windrow area into using the extended aerated static pile method. This is another one of our project sites in Texas. It is processing biosolids and shredded wood. In the picture on the left, you see roughly a square area with an arrow pointing to it which is enlarged on the right photo. From Part 1 in this series, this is a picture of a cross section of an extended aerated static pile. 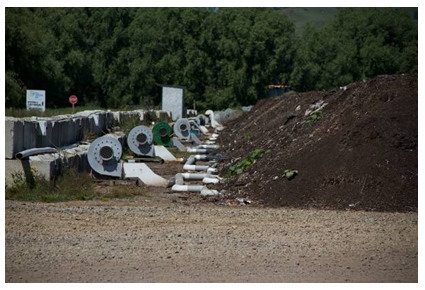 In this case, we are adding cells day by day and pipe by pipe, making the pile width wider as we go. As you can see, on top we have added a layer of unscreened compost to serve as our thermal retention layer as well as our biofilter layer for odor control. Looking at that scenario, this is an extended aerated static pile here at one of our sites in Snohomish, Washington. This measures about 80 feet by 140 feet and starts out about 10 feet tall. It has a total volume of about 3500 cubic yards and is operated by four 5-horse power portable blowers. This pile will typically sit for 30-45 days before being deconstructed, screened and transferred into curing and storage. Looking at this same site vertically, you can see a number of extended aerated static piles with very little area between the respective piles for the blowers. Using this as an example as an example and as a model, and returning to our site in Texas, we take that picture and super-impose on it seven extended aerated static piles, each measuring about 80x135 feet. You will notice at the bottom there is on rectangle left open. This represents the pile that is being constructed and the pile that is being deconstructed at any moment in time, resulting in seven piles that are actively composting on this site. If we look at that same site and consider a tow-behind windrow turner, we are actively increasing the volume and capacity of that site by six to eight times. Another approach is what we call our Continuous Flow or “Wedge” Method. This is a project that I’ve worked on for the past three years in Auckland, New Zealand. It was a pretty ugly mess to begin with but we’ve converted it over into an extended aerated static pile whereby we have a single pile that migrates across the site and is aerated by a series of 11 high-pressure, high-volume blowers. At the leading edge on the left, we are adding material which is freshly ground and building that next cell, and simultaneously removing the material from the right side of that gap and creating additional space. In this way, the gap between the two piles migrates across the site and for this particular project the pile is in place for about 8 weeks, resulting in about 6 to 6.5 cycles per year. Looking at how the pile is constructed, the green waste is shredded and delivered with a front-end loader to the advancing face of the pile. 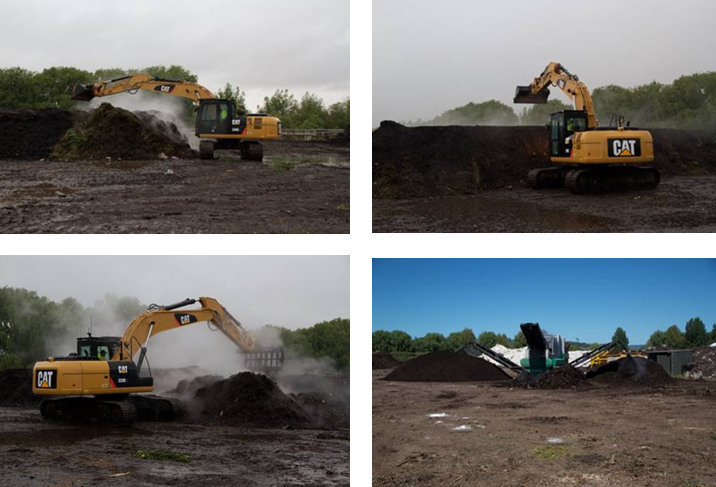 The next day, an excavator is used to shape that cell, flatten the top, and then additional unscreened compost is delivered and placed on top of the raw feedstock to serve as thermal blanket and as the biofilter for odor control. Once that has been completed, the excavator turns around, replaces the bucket with a rake device, and excavates an equivalent area from the receding face on that pile and transfers it into curing. 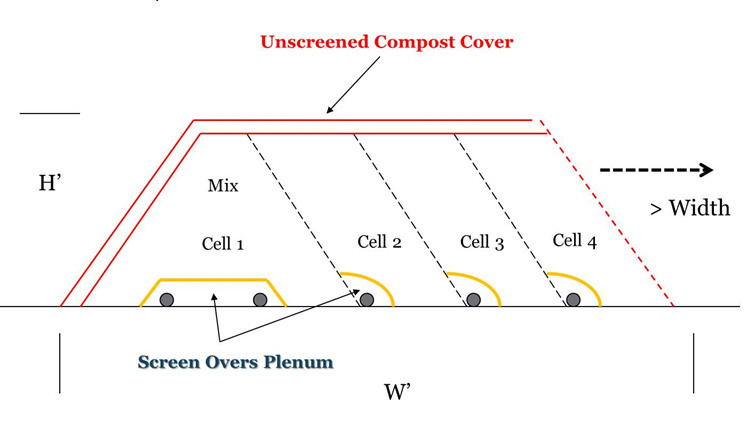 The material sits in curing for another 6 to 8 weeks and then is ultimately screened – in this case with a three-deck star screen which divides it into their finished product, their fraction (which is what they call their “mids” and used as a biofilter cover, and then their smallest fraction which is their coarse overs which is chock full of plastic and debris and sent to the landfill. As I mentioned earlier, this project had terrifically horrendous odor problems and neighbor complaints and were on the verge on being shut down. This approach has resolved virtually all of their odor impacts offsite. This will be a topic of our next webinar. How do you construct the pie without damaging the pipes? We lay the pipe down, place an aeration plenum layer over the top which facilities the movement of air across the base of the pile, and then we construct the pile from the side so we are never running up and over the top of that pipe. In some cases we use disposable pipe but, more and more, we’re using thick wall high-density polyethylene pipe where the wall thickness I approaching ½ inch. In that case, the pipe is so durable that we can literally chain up to it and pull it out from underneath – or we can scalp the material from the top. How do you recover the pipes when you break down the pile? Quite literally, I have videos where we are pulling the pipe out from underneath the pile, or we can scalp and man-handle the pipe off to the side – whichever we choose. How high can you make the pile before you compromise the aeration system? In most cases, depending on the feedstocks, the porosity, and the bulk density and so forth, we like to make the piles no more than 10-12 feet, including the biofilter cover layer. How do you get the cover layer on top of the raw feedstocks? This can be a bit tricky but, as we are building the pile, we will place the material on top and rake it out with the excavator. In some cases we use a telehandler. In some cases we have a very experienced front-end loader operator which does an excellent job. This concludes the second part of our webinar series: Increasing Site Capacity. If you have any comments or questions, please direct them to me: Peter Moon through our contact form.